Carolyn Glover (BSc. ) 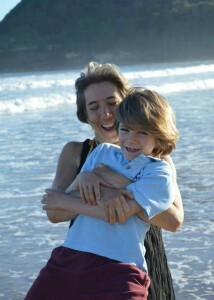 is a mother of two young boys and moved to the Central Coast from Sydney in 2008. Carolyn is passionate about the change that Yoga can bring. Yoga classes rescued her body from complete destruction, working 60 + hrs pw in hospitality in her mid 20’s. Still able to move, it has been a source of joy and freedom ever since and Carolyn continued the journey as a student through the pre and post natal stages of both births. After two ceasarean sections, it was vital to find a yoga class that could support both physical changes and emotional changes – not always easy and over the last 10 years Carolyn has taken classes with maybe 50 different teachers. A move to the Central Coast in 2008 necessitated a career change – and teacher training under the framework of Byron Yoga Centre (www.byronyoga.com.au). Carolyn has qualified with Yoga Australia 500 hour Teaching Certification. But learning never stops and she continues to study Yoga Therapy Teacher training with Judy Krupp (www.theyogaroom.com.au) and Maria Kirsten (www.yogaforgrownups.com).